Beautiful Chalet Style home on 5 private acres in the Sierra Springs neighborhood is waiting for you and your family to enjoy! 2600 sq ft home with large living room with woodburning stove and large dining room with sun filled windows for your family dinners or a special dinner for two. 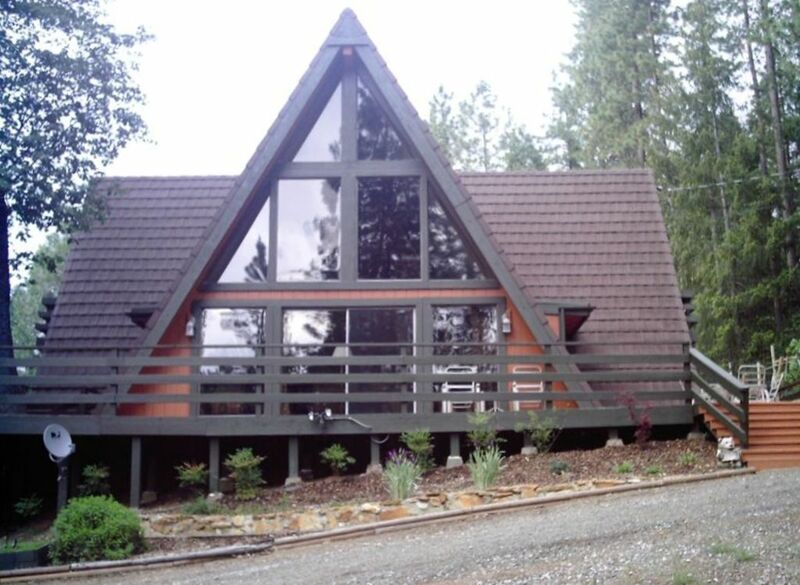 See our many guest reviews describing this great house and the fun they had. Enjoy the view from every room: gentleman's vineyard, wild turkeys and deer as you enjoy the outdoor life with wrap around decking and balconies from each bedroom. Two levels with a full bath with tub on each floor. Master bedroom with bath on lower level. Fully furnished kitchen with tile counter, hardwood floor and all appliances, utensils, dishware provided. Ceiling fans in all rooms. Extra large deck with outdoor dining tables and grill. Close to Placerville, Jenkinson's Sly Park Lake Recreation Area, Skiing 45 minutes away, Apple Hill, Somerset, and FairPlay Wineries. Lazy rivers, swimming, boating, fishing, waterskiing, boat Rental at lake, explore the Gold Country as you enjoy your get away. Please check the VRBO for availability and call or email if you have questions. My husband and I enjoy being outdoors in the country and getting away to the fresh peaceful mountain air. When we were younger, we enjoyed camping, but as we got older we realized we like the feel of being outdoors with the comfort of a bed! My husband planted the gentleman's vineyard on our property to realize his dream of making wine; like his father did in the old country. We feel like our place is 'our little piece of heaven' and enjoy entertaining friends and family. We chose this home, not for a vacation rental, but as a mountain retreat for ourselves and our family. We love the area since there is so much to do such as wine tasting, swimming in rivers and lakes, fishing and hiking short trips to Tahoe. Our son snowboards every winter so he and his friends enjoy the closeness of the Ski resorts to get together and have fun. Mostly we have spent our time relaxing and entertaining our friends and family here. We also have a feeling of relaxation and relief when we arrive and cannot wait to return. What we most enjoy about our property are the beautiful seasons and dining outside on the large deck while enjoying the broad night sky with all the stars in view. The house is very roomy so it allows our large family to be there without feeling crowded--everyone has their space. The property is on 5 acres with 5 vacant acres next door, so this allows for privacy. I love the fact that rarely do we hear road noise and we can sit in my pajamas on the front deck without a care in the world! Sliding doors open to large deck and propane bbq. Balcony off each upstairs bedroom. Deck wraps around entire lower level of house. This is great since you can enjoy the sun or shade all day. Sierra Ski Ranch 45 minutes away. Tennis courts at neighborhood club house. Pool table, Ping pong and football our kids loved playing. The location couldn't have been better for us as we were spending Thanksgiving with family in the same neighborhood. The layout of the home was great. Very spacious and open. The kitchen was well stocked too. The three instead of five stars is due to the cleanliness of the house. It was filthy. While the sheets appeared clean with a surface clean of the bedrooms, kitchens and bathrooms, the dust, dirt and cobwebs were a bit much. Puffs of dust/dirt literally clouded up when you sat on the couches or tapped the arms of the furniture. The bathroom drawers were full of half used toiletries of previous renters. With a deep clean with routine cleanings between renters, this will be a five star rental! We only had a short weekend to enjoy the space, but it was so relaxing and we would definitely rent this house again. The deck is amazing, and it was so lovely to sit out at night and enjoy the silence. The owners have put a lot of work and time into giving you all the information you need to arrive there safely and explore the area. Great communicators, great space, well stocked with everything we needed and a perfect weekend ! Thank you!!!! Picture's do no justice . Loved this place. It is amazing if you love the fresh air and peaceful sounds of the night. Polite wild deer to great you as you arrive. The house has everything you need to accommodate you'r loved ones. Could not have asked for anything more from the owners, very pelite. Best decision you can make is staying here. The outside deck is a perfect place to quietly enjoy nature, or have a family gathering, as we did. There is plenty of seating inside or on the deck with 2 tables. The kitchen is well stocked. Perfect place to unwind & realax for the weekend. Remote enough to get away but close enough to lake & grocery store to make a run for the necessities! We’ll be coming back for sure!